LitePlacer: The Low Cost Prototype Builder’s Pick and Place Machine « Adafruit Industries – Makers, hackers, artists, designers and engineers! What is a pick and place machine anyway? 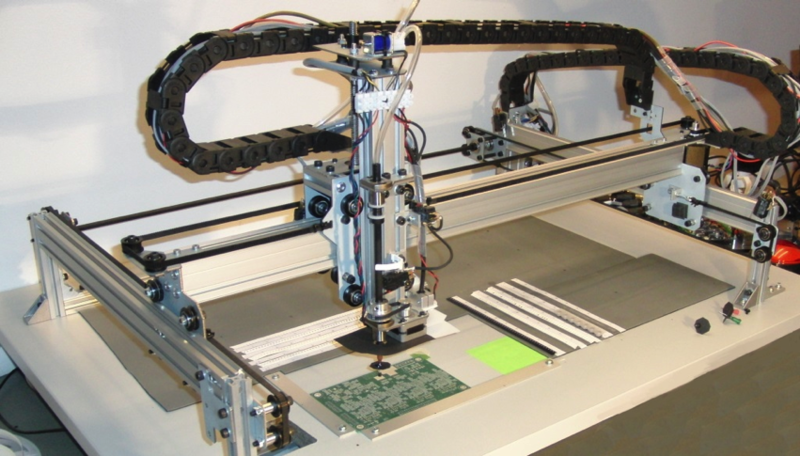 A pick and place machine puts the components on circuit boards at assembly phase. Typically these machines are used for surface mounted devices (SMD). The LitePlacer is unique because it is the first affordable desktop machine aimed for prototype boards. For developers, hackers, makers, advanced hobbyists, anyone who assembles electronic circuit board prototypes! Yes. If you build SMD prototype boards more than a few a year, I believe you need one. If you have trouble with small components such as 0603s or 0402s you do need a machine. If you are building complex prototypes with a few hundred components, you also need a machine, unless you are very fast by hand placement. Remember, the paste typically dries out in three or four hours after placement. All things add up and it is hard to do better than about 100 components per hour on a new board, unless it is something like a LED matrix, where most components are of same type and same orientation. But to be honest, if your typical board is 20 passive components and one IC, hand soldering is a viable option. Of course, if you just want to have a cool industrial desktop robot, I’m happy to sell you a kit!